Goodell and the NFL have for too long gotten away with censoring the opinions of the athletes. The National Football League has recently become a magnet for scandal. In the past year alone, the league has struggled through charges of both domestic and child abuse, handling each case with such a sense of apathy and ineptitude it makes fans and analysts alike wonder if commissioner Roger Goodell has ever heard the term “public relations.” Now, the NFL finds itself engulfed in the spotlight of controversy once more, this time centering around the league’s pointlessly complex and restrictive uniform policy. Earlier this season, Pittsburgh Steelers running back Deangelo Williams was denied of his request to wear pink on his uniform throughout the season to honor the death of his mother, Sandra Hill. Hill, after a long struggle with breast cancer, died this past May. Williams’ four aunts also suffered from the disease, each passing away from 1992 to 2011. The NFL regularly allows its players to wear pink throughout the month of October to spread awareness of breast cancer; however, Williams’ request was to wear pink for the rest of the year. His request was rejected. Unamused, Williams ignored the ruling. 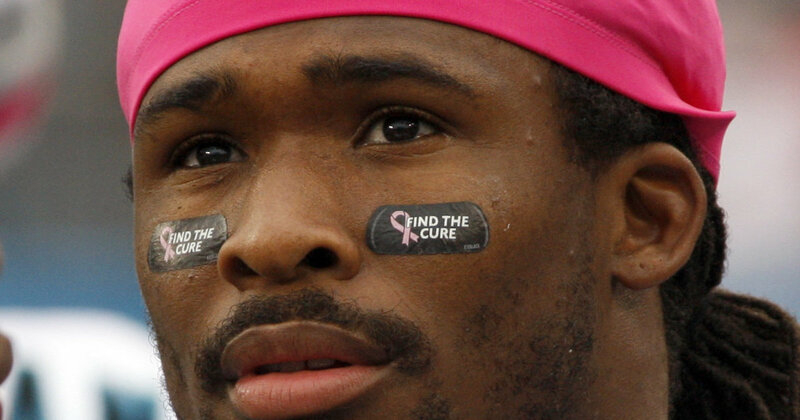 Following the month of October, Williams continued to honor his mother, inscribing a pink ribbon and the phrase “we will find a cure” on his eye black. According to ESPN, this was relatively common for Williams, as he has worn “special” eye black like this for years. The NFL didn’t find the tribute as noble as he did. Instead, the league fined Williams $5,787 for his action, citing a bylaw in the league’s Uniform Policy banning “personal messages”. In a public statement made after the decision, the NFL clarified that they–as well as players–must abide by the rules. But have they? According the ESPN’s Jeremy Fowler, they haven’t. Williams’ fine marks his first for wearing special eye black, despite the fact he has worn “find the cure” eye black for five years. From this, it seems the NFL has a more lax policy on enforcing the rules than they’d like fans to believe. In keeping with this absurd perversion of the rules, the NFL has also fined Steelers defensive end Cam Heyward for wearing eye black with the words “Iron Man” inscribed, meant to honor his father’s fight against cancer. In fining Heyward, the NFL again cited against “personal messages”. I can empathize with the purpose behind a strict uniform code. Keeping clear guidelines is in the best interest of the league, as proper uniforms creates a baseline standard of equality for all. Some rules are even in the best interest of the player, such as restrictions on visor tinting that hinder medical officials from properly assessing injuries, most notably concussions. I can also understand why the NFL might want to “filter” personal messages conveyed by its players. Football is not an ideal political arena, and keeping tabs on personal messages helps keep the league in control of its brand’s message to fans. Otherwise, the league would transform into a cacophony of different political statements and outbursts, tarnishing the league’s intended “neutral” brand image. But these recent crackdowns are ridiculous. Not only are they a gross exaggeration of the “personal messages” clause, they haven’t even been consistently enforced. Fines like those towards Williams and Heyward have only make news headlines recently, despite being in existence for years prior, ignored every step of the way. All of us, athletes or not, have rights to freedom of speech–barring few exceptions. Declaring one’s support for breast cancer is not one of those exceptions. Wearing eye black with a small message on it also does not ruin the functionality of the uniform. Fans can still identify that Williams is part of a team and represents the NFL, and does not deviate far at all from the norm. If the NFL is so hyper-concerned about the message its brand sends, maybe it should first look at its own double standard to blame. The league has consistently butchered its handling of scandals regarding domestic abuse, child abuse, and even murder, failing to provide key details and delivering comically weak punishments to offenders. This is the message the NFL sends to its fans, and it is in no way positive. Allowing Williams to wear simple eye black with a message of positivity and awareness would undoubtedly be a better one, but they turned it away. Goodell and the NFL have for too long gotten away with censoring the opinions of the athletes. All Williams and Heyward wanted was to honor the deaths of those they cared about–something they clearly have the right to do. In an act of spite and support, Williams actually died his hair pink to get his message across, paying homage to the millions who suffer from the debilitating disease.